Sandong Yin He Yi Hai Real Estate Development Co., Ltd.
Shenzhen CHC Architectural Design Co., Ltd. The Olympic Residences in the City of Yantai derives its name from the Olympic Training facility for the Chinese Badminton Teams, that this urban masterplan is located directly adjacent to. Phase I of the project site consists of 13 existing residential high-rise towers, which look out over Taozi Bay, on the northwest edge of the Yellow Sea. A phase II expansion of this prominent residential tower enclave features 12 new additional high-rise buildings sited on 6.8 HA. This upscale high-density project is built mainly over a large subterranean parking structure and features highly amenitized ‘public’ common garden areas for use by the residents, in the open space between the high-rise towers. Each open space has a distinct landscape theme, with large ‘flex’ lawn areas, and its own distinct dynamic form. 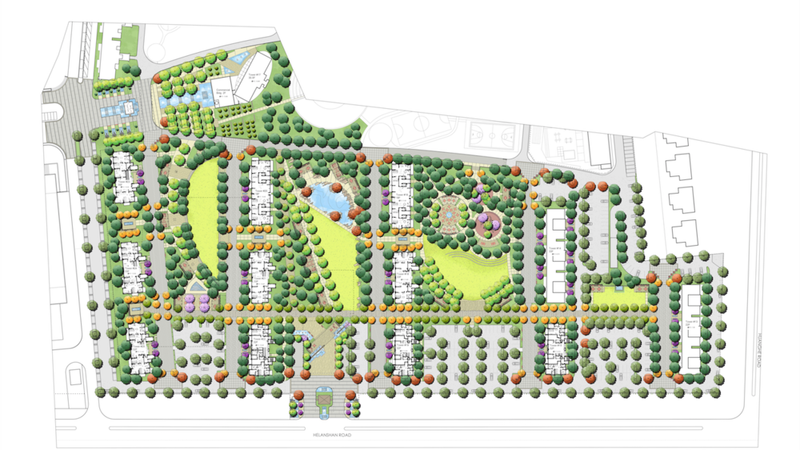 The court yards provide the residents with community gathering spaces, outdoor fireplace lounge areas and family shade shelters with cooking facilities, as well as water features, interactive fountains, playgrounds and a performance stage with lawn amphitheater seating, for outdoor entertainment.